Though all the timeframes are up, structurally banknifty futures looking weak due to the nature of consecutive overlapping consolidation phases as shown below. Structurally weak – doesn’t mean that market has to go down but the risk involved in longs are tremendously increased. Two more unfaded gaps added in this week which will act as a critical reference in the upcoming sessions. Gaps are around 22027 and 21860. And Since 2017 banknifty futures holds 6 unfaded gaps. On Fridays trading session, banknifty ended with the failed auction at the days low which have the odds of revisiting on t+5 days. And also left a pullback low at 22299 which will serve as a critical reference on upcoming Tuesdays trading. 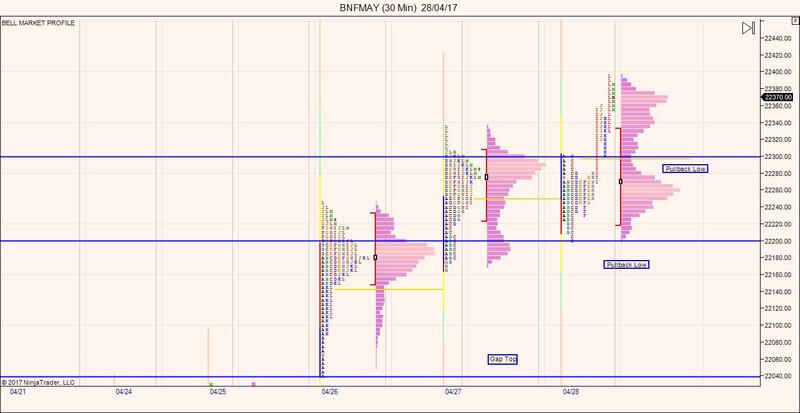 It is noted that Fridays profile is not elongated and value area is overlapping to previous days profile(Two day balance formation). As price migrated higher during the last half of the trading session, fridays developing POC failed to migrate in tandem as the profile got 9 TPO wide. 1)Price Opens Gap Up – If the price opens gap up above friday high – then possibilities are that we could have a gap fading as the inventory got too long in the last six trading sessions. Value is expected to form higher/ overlapping to higher in such a scenario with pullback low 22299 zone act as support zone. 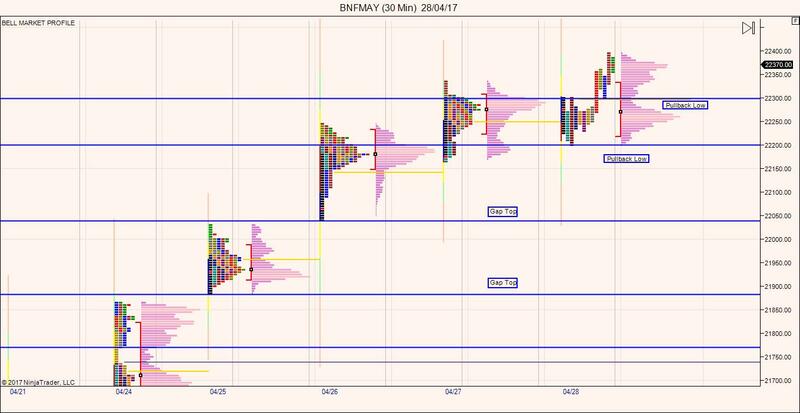 Price acceptance above 22299 is critical in this setup for the value area to stay higher/overlapping to higher. 2)Price opens Gap Down – Gap down in bank Nifty indicates a potential weakness and could be the result of too much of long inventory piled up. And Price acceptance below the pullback low 22299 zone indicates change in sentiment from positive to negative. Value is expected to form lower in this scenario and the potential odds of testing the lower immediate gaps at 22027 and 21860 increased. 2)Price Open withing the range – If the price opens within the range and had a acceptance below 22299 then the next destination trade is towards the failed auction low 22199. Value could be overlapping to lower.